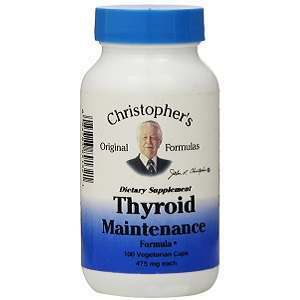 Welcome to our comprehensive product review for Dr. Christopher’s Thyroid Maintenance Formula. This dietary supplement contains herbal ingredients that aid the thyroid gland and glandular systems. It also supports the body’s metabolic processes. Read on to acquire more information about this dietary supplement. Organic Kelp Plant- This ingredient is known for its sufficient amounts of iodine. Iodine plays a significant role in stimulating a sluggish thyroid gland. It takes part in the production of thyroid hormones. It also encourages healthy metabolic processes. Wildcrafted Watercress Plant- Watercress is also rich in iodine. Therefore, it is essential for a malfunctioning thyroid. Wildcrafted Nettle Leaf- This ingredient is a thyroid tonic. Nettle leaves contain numerous micro and macro elements including iodine, copper, manganese, zinc, and selenium. These elements are known for their ability to support thyroid function, metabolism, and the immune system. Organic Mullein Leaf- This ingredient is essential for treating underactive thyroid. It also diminishes glandular inflammation. Organic Parsley Leaf- It improves thyroid health. Organic Irish Moss- This seaweed performs several roles such as soothing swollen glands and moistening dry skin. This product has no added chemicals or fillers. The suggested dosage for this dietary supplement is two capsules three times per day. You can also take it according to the directions of a health care practitioner. The price of one bottle with 100 vegetarian capsules is $19.99 on the manufacturer’s site. However, you can purchase this product from other online platforms at a lower price. We are concerned that this price is relatively low compared to the price of other related products. A low price may raise quality-related issues. Nevertheless, this price is affordable. We were unable to find a satisfaction guarantee for this dietary supplement. According to the manufacturer’s return policy, customers can only return sealed and unopened products. Moreover, customers should make claims within 7 days. Returns are not accepted after 21 days. It general, customers who have opened the product and are dissatisfied with the results are unlikely to get a refund of the purchase amount. We identified many reviews from customers who have tried this product. Based on the large numbers of positive reviews, there is no doubt that most customers are happy with the results. Many positive testimonials encourage those who have not bought the product to try it. In conclusion, it is advisable to compare the merits and drawbacks of this dietary supplement in order to make the right purchase decision. We have identified several positive features that might attract customers. For instance, this product is safe because it contains a powerful blend of natural ingredients with no chemicals or fillers. Furthermore, this product has large numbers of positive customer reviews indicating that most users are satisfied. This product also has some negative features. For example, there is no compensation for opened products. Moreover, it is not clear whether this product is manufactured in a GMP-certified facility. In addition, the product’s low price is questionable. Lauren Shepherdson	reviewed Dr. Christopher's Thyroid Maintenance Formula	on November 23rd	 and gave it a rating of 3.